Starting last Thursday, Heroku suffered the worst outage in the nearly four years we’ve been operating. Large production apps using our dedicated database service may have experienced up to 16 hours of operational downtime. Some smaller apps using shared databases may have experienced up to 60 hours of operational downtime. Code deploys were unavailable across some parts of the platform for almost 76 hours – over three days. In short: this was an absolute disaster. A number of people asked about the technical aspects of the great Delicious exodus of 2010, and I’ve finally had some time to write it up. Note that times on all the graphs are UTC. I got the message just as I was starting work for the day. My Twitter client, normally a place where I might see ten or twenty daily mentions of Pinboard, had turned into a nonstop blur of updates. My inbox was making a kind of sustained pealing sound I had never heard before. It was going to be an interesting afternoon. Before this moment, our relationship to Delicious had been that of a tick to an elephant. We were a niche site and in the course of eighteen months had siphoned off about six thousand users from our massive competitor, a pace I was was very happy with and hoped to sustain through 2011. 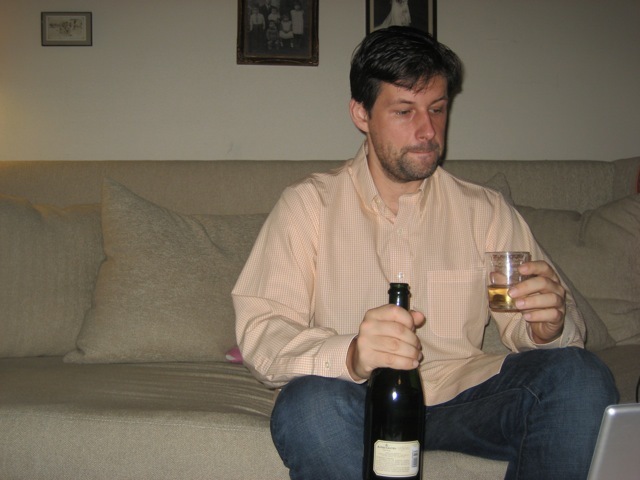 But now the Senior Vice President for Bad Decisions at Yahoo had decided to give us a little help. 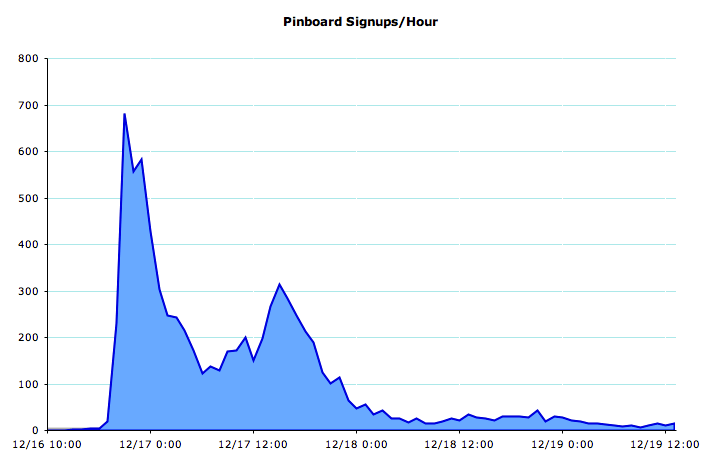 I’ve previously posted this graph of Pinboard web traffic on the days immediately before and after the Delicious announcement. That small blue bar at bottom shows normal traffic levels from the week before. The two teal mountain peaks correspond to midday traffic on December 16 and 17th. My immediate response was to try to log into the server and see if there was anything I could to do keep it from falling over. Cegłowski’s first law of Internet business teaches: “Never get in the way of people trying to give you money”, and the quickest way to violate it would have been to crash at this key moment. To my relief, the server was still reachable and responsive. 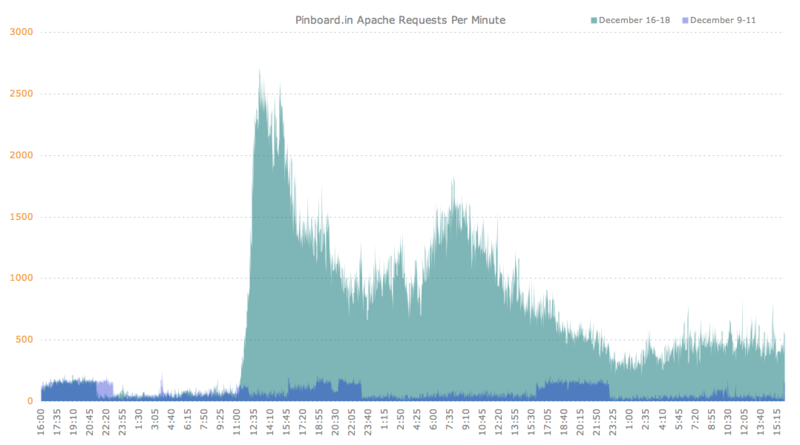 A glance at apachetop showed that web traffic was approaching 50 hits/second, or about twenty times the usual level. This is not a lot of traffic in absolute terms, but it’s more than a typical website can handle without warning. Sites like Daring Fireball or Slashdot that are notorious for crashing the objects of their attention typically only drive half this level of traffic. I was expecting to have to kill the web server, put up a static homepage, and try to ease the site back online piecemeal. But instead I benefitted from a great piece of luck. Pinboard shares a web server with the Bedbug Registry, a kind of public forum for people fighting the pests. I started the registry in 2006 (a whole other story) and it existed in quiet obscurity until the summer of 2010, when bedbugs infested some high-profile retail stores in New York City and every media outlet in the country decided to run a bedbug story at the same time. Thanks to this, the Pinboard web server ran like a champ throughout the Delicious exodus even as other parts of the service came under heavy strain. We were able to keep our median page display times under a third of a second through the worst of the Yahoo traffic, while a number of other sites (and even the Delicious blog!) went down. This gave us terrific word-of-mouth later. Of course, had bedbugs been found in the Delicious offices, our server would have been doomed. As you can see, we had a big web server connected to an even bigger database server, with a more modest third machine in charge of background tasks. I had just come out of Rails consulting when I started Pinboard and really wanted to avoid this kind of overengineering, capitalizing instead on the fact that it was 2010 and a sufficiently simple website could run ridiculously fast with no caching if you just threw hardware at it. After trying a number of hosting providers I found Digital One, a small Swiss company that rented out HP blade servers with prodigious (at least by web hosting standards) quantities of RAM. This meant that our two thousand active users were completely swallowed up within a vast, cathedral-like database server. If you offer MySQL this kind of room, your data is just going to climb in there and laugh at you no matter what kind of traffic it gets. Since Pinboard is not much more than a thin wrapper around some carefully tuned database queries, users and visitors could page through bookmarks to their hearts’ content without the server even noticing they were there. That was the good news. The bad news was that it had never occurred to me to test the database under write load. Now, I can see the beardos out there shaking their heads. But in my defense, heavy write loads seemed like the last thing Pinboard would ever face. It was my experience that people approached an online purchase of six dollars with the same deliberation and thoughtfulness they might bring to bear when buying a new car. Prospective users would hand-wring for weeks on Twitter and send us closely-worded, punctilious lists of questions before creating an account. There were thousands of new users, and each arrived clutching an export file brimming with precious bookmarks. Within a half hour of the onslaught, I saw that imports were backing up badly, the database was using all available I/O for writes, and the two MySQL slaves were falling steadily behind. Try as I might, I could not get the imports to go through faster. By relational database standards, 80 bookmark writes per second should have been a quiet stroll through a fragrant meadow, but something was clearly badly broken. To buy a little time, I turned off every non-essential service that wrote anything to the database. That meant no more tag clouds, no bookmark counts, no pulling bookmarks from Instapaper or Twitter, and no popular page. It also meant disabling the search indexer, which shared the same physical disk. Notice the fixed-length char instead of the saner variable-length varchar. This meant MySQL had to use 765 bytes per tag just for that one field, no matter how short the actual tag was[***]. I’m sure what was going through my head was something like ‘fixed-width rows will make it faster to query this table. Now how about another beer!’. Having made this brilliant design decision, I so thoroughly forgot about it that in later days I was never able to figure out why our tags table took forever to load from backup. The indexes all seemed sane, and yet it took ages to re-generate the table. But of course what had happened was the table had swollen to monstruous size, sprawling over 80 GB of disk space. Adding to this table and updating its bloated index consumed three quarters of the write time for every bookmark. Had I realized this that fateful afternoon, I might have tried making some more radical changes while my mind was still fresh. But at that moment the full magnitude of what we were dealing with hadn’t become clear. We had had big spikes in attention before (thanks @gruber and@leolaporte! ), and they usually faded quickly after a couple of hours. So I focused my efforts on answering support requests. Brad DeLong, the great economics blogger, was kind enough to collect and publish our tweet stream from that day for posterity. We had always prided ourself on being a minimalist website. But the experience for new users now verged on Zen-like. After paying the signup fee, a new user would upload her delicious bookmarks, see a message that the upload was pending, and… that was it. It was possible to add bookmarks by hand, but there was no tag cloud, no tag auto-completion, no suggested tags for URLs, the aggregate bookmark counts on the profile page were all wrong, and there was no way to search bookmarks less than a day old. This was a lot to ask of people who were already skittish about online bookmarking. A lot of my time was spent reassuring new users that their data was safe and that their money was not winging its way to the Cayman Islands. At seven PM Diane ran out for a bottle of champagne and we gave ourselves ten minutes to celebrate. Here I am watching three hundred new emails arrive in my mailbox. To add spice to the evening, our outbound mail server had now started to crash. Each crash required opening a support ticket and waiting for someone in the datacenter to reboot the machine. Whenever this happened, activation emails would queue up and new users would be unable to log in until the machine came back online. This diverting task occupied me until midnight, at which point I had been typing nearly nonstop for eleven straight hours and had lost about fifty IQ points. 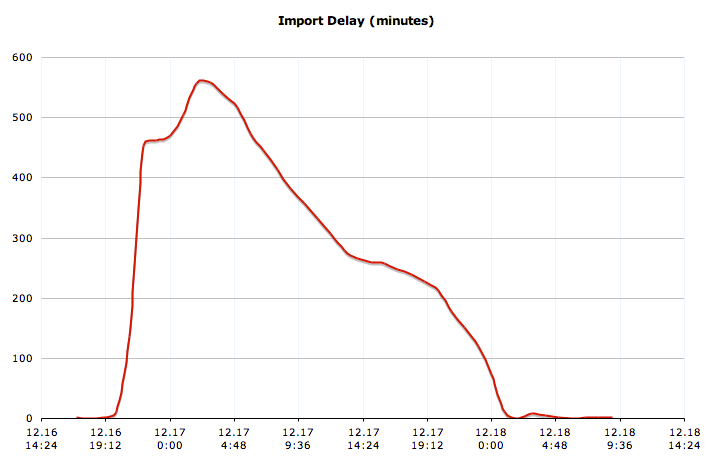 And imports were still taking longer and longer; at this point over six hours. My hope had been that we could start to catch up after California midnight, when web traffic usually dies down to a trickle. But of course now Europe was waking up to the Yahoo news and panicking in turn. There was no real let-up, just the steady drumbeat of new import files. At our worst we fell about ten hours behind with imports, and my wrists burned from typing reassuring emails to nervous new customers explaining that their bookmarks, would, in the fullness of time, actually show up on the big blank spot that was their homepage. We added something like six million bookmarks in the first 24 hours (doubling what we had collected in the first year and a half of running the site), another 2.5 million the following day, and a cumulative ten million new bookmarks in that first week. Fully refreshed, I could turn my attention to the next pair of crises: tag clouds and archiving. Tag clouds on Pinboard are a simple UI element that shows the top 200 or so tags you’ve used on the right side of your home page. Since I had turned off the script that made the clouds, new users were apprehensive that their tags had not imported properly. Up to this point I had generated tag clouds by running a SQL query that grouped all a user’s tags together and stored the counts in a summary table. Anytime a user added or edited a bookmark they got thrown on a queue, and a script lurking in the background regenerated their tag counts from scratch. This query was fairly expensive, but under minimal load it didn’t matter. Of course, we weren’t under minimal load anymore. The obvious fix was to calculate the top tags in code and only update the few counts that had changed. But coding this correctly was surprisingly difficult. The experience of programming on so little sleep was like trying to cook a soufflé by dictating instructions over a phone to someone who had never been in a kitchen before. It took several rounds of rewrites to get the simple tag cloud script right, and this made me very skittish about touching any other parts of the code over the next few days, even when the fixes were easy and obvious. The part of my brain that knew what to do no longer seemed to be connected directly to my hands. Like many other parts of the service, the crawler was set up to run in one process per server. It was imperative to rewrite the crawler script so that multiple instances could run in parallel on each machine, and then set up an EC2 image so that we chew through the backlog even faster. The EC2 bill for December came to over $600, but all the bookmarks were crawled by Tuesday, and my nightmare of endless refund requests didn’t materialize. On Monday our newly provisioned server came on line. Figuring that overkill had served me well so far, this one had 64 GB of memory and acres of disk space. On Tuesday morning I was invited to appear on net@night with Leo Laporte and Amber MacArthur, who were both terrifically encouraging. At this point I could barely remember my own name. And then, mercifully, it was Christmas, and everyone got offline for a while. It is terrifying and you are very tired. At the outset Peter and I had to do live SQL queries to find user accounts, fix names, emails, and logins, and do other housekeeping tasks. I lived in constant fear of forgetting a WHERE clause. I could have avoided a very large volume of email correspondence by having a status page to point to that told people what services were running and which were temporarily disabled. There were multiple places in my code where I queried a slave and updated the master. This only works if you don’t care about being many hours out of date. For example, it would have been fine for the popular page, but was not acceptable for bookmark counts. To quote a famous businessman: “It costs money. It costs money because it saves money“. And a final, special shout-out goes to my favorite company in the world, Yahoo. I can’t wait to see what you guys think of next! * The list also included the mysteriously indestructible Yahoo Bookmarks, though that didn’t seem to affect anyone. How Yahoo Bookmarks has persisted into 2011 remains one of the great unsolved mysteries of computer science. ** I should point out that Yahoo claims Delicious is alive and well, and will bounce back better than ever just as soon as they can find someone — anyone — to please buy it. Since the entire staff has been fired and the project is a ghost ship, I’m going to stick with ‘demise’. *** This is because utf8 strings in MySQL can be up to three bytes per character, and MySQL has to assume the worst in sizing the row. **** I ended up extending the refund window by seven days and giving everyone a free extra week of archiving. 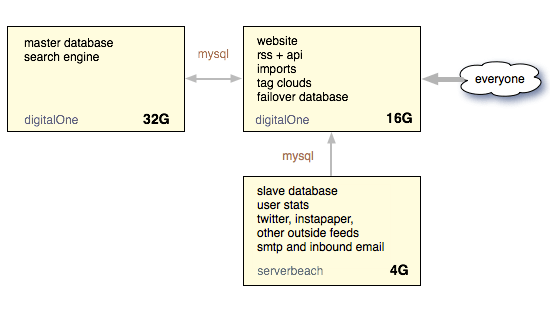 machines hosting the MongoDB database used for check-ins. This is an account of what happened, why it happened, how it can be prevented, and how 10gen is working to improve MongoDB in light of this outage. Another pdf file to the final analysis of the 2003 power blackour in the NE United States. The relevant root cause information is included below. This chapter explains the major events—electrical, computer, and human—that occurred as the blackout evolved on August 14, 2003, and identifies the causes of the initiation of the blackout. The period covered in this chapter begins at 12:15 Eastern Daylight Time (EDT) on August 14, 2003 when inaccurate input data rendered MISO’s state estimator (a system monitoring tool) ineffective. At 13:31 EDT, FE’s Eastlake 5 generation unit tripped and shut down automatically. Shortly after 14:14 EDT, the alarm and logging system in FE’s control room failed and was not restored until after the blackout. After 15:05 EDT, some of FE’s 345-kV transmission lines began tripping out because the lines were contacting overgrown trees within the lines’ right-of-way areas. By around 15:46 EDT when FE, MISO and neighboring utilities had begun to realize that the FE system was in jeopardy, the only way that the blackout might have been averted would have been to drop at least 1,500 MW of load around Cleveland and Akron. No such effort was made, however, and by 15:46 EDT it may already have been too late for a large load-shed to make any difference. After 15:46 EDT, the loss of some of FE’s key 345-kV lines in northern Ohio caused its underlying network of 138-kV lines to begin to fail, leading in turn to the loss of FE’s Sammis-Star 345-kV line at 16:06 EDT. The chapter concludes with the loss of FE’s Sammis-Star line, the event that triggered the uncontrollable 345 kV cascade portion of the blackout sequence. The loss of the Sammis-Star line triggered the cascade because it shut down the 345-kV path into northern Ohio from eastern Ohio. Although the area around Akron, Ohio was already blacked out due to earlier events, most of northern Ohio remained interconnected and electricity demand was high. This meant that the loss of the heavily overloaded Sammis-Star line instantly created major and unsustainable burdens on lines in adjacent areas, and the cascade spread rapidly as lines and generating units automatically tripped by protective relay action to avoid physical damage.